Stonewall Gazette: Broadway's Tarzan Comes Out Of The Closet! "Star of Peepshow and new E! reality show Holly’s World, Josh Strickland reveals why, despite much speculation during his stint as Broadway’s Tarzan, he hasn’t discussed his sexuality in interviews until now." 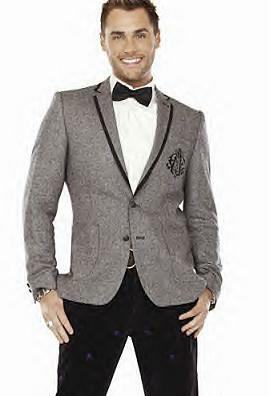 A promising contestant cut right before semifinals on season 2 of American Idol, Josh Strickland swung back into the national spotlight in 2006 as the loinclothed lead in Disney’s Tarzan, a critically maligned musical that ran for more than a year on Broadway. Strickland currently suits up as the main male vocalist in Peepshow, Jerry Mitchell’s popular burlesque review at Planet Hollywood in Las Vegas. Thanks to Strickland’s friendship with Peepshow costar Holly Madison, the 26-year-old South Carolina native now appears in her Girls Next Door spin-off, Holly’s World, which premieres June 13 on E! Opening up about his Idol journey and controversially trim Tarzan torso, Strickland shows The Advocate a peep into his life as a proud gay man. Advocate: During Tarzan there was a lot of speculation about your sexuality on various blogs and Broadway chat rooms. Were you aware of that? Josh Strickland: I did know that was going on, but I tried not to look at blogs because some of it was so nasty. It’s fine that people were talking about it, but I was never asked, like, “Are you gay? How does it feel being gay and playing a character like Tarzan?” It never came up. Now I’m happy to be open and out about it. If people are going to speculate anyway, why not wash all that speculation away? I am who I am. Advocate: There were rumors floating around that Disney tried to keep your sexuality a secret by preventing you from speaking too much and by limiting your interviews. Josh Strickland: Disney’s one of the best companies to work for, and I never had any complaints. What they did for me was put me in a class for media training. They gave me talking points about the show, but they didn’t tell me what I couldn’t talk about. I was never held back from being who I am. The questions people asked were just never about my sexuality. Advocate: At what point did you decide that you’d be honest about it if you were asked? Josh Strickland: It was from all that speculation during Tarzan. I was really tired of people making up their own answers. I’d rather just put it to rest and be myself. Nowadays it really doesn’t even matter. You see people coming out all the time, and it makes them stronger and happier. I didn’t want to be one of those souls struggling every day to fight who I am. I’m 10 times better just by being out and open about it. It makes my life so much happier. I have no regrets about anything. Read the full interview with Josh Strickland here.